Luminescent Glass Pendant 14" Necklace. This beautifully Luminescent Glass Pendant captivates and captures the light at every angle! 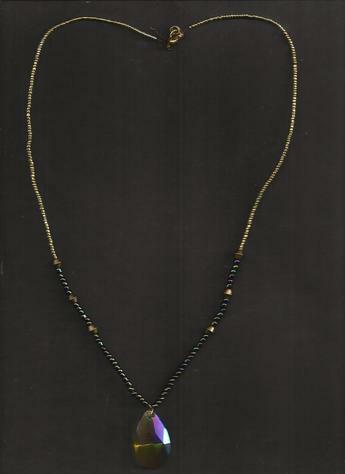 A variety of Autumn colored-beads and gold seed beads on a 14-inch Brown-copper-plated wire and a brass-plated easy-to-use clasp. SO LIGHTWEIGHT & COMFORTABLE YOU WILL FORGET YOU HAVE IT ON! FOR THE REMAINDER OF 2017, 50% OF BLR'S FASHION JEWELRY PROFITS, WILL BE DONATED TO THE AMERICAN RED CROSS. Autumn Pendant Necklace Captures the Light at Every Angle! LIGHTWEIGHT & COMFORTABLE! Autumn Pendant Necklace Beautiful Luminescent Colors at Every Angle!